Parents of children with developmental disorders, and Autism Spectrum Disorders (ASDs) in particular, are recognized as coping with elevated parenting demands and are at higher risk of stress, depression and family distress. 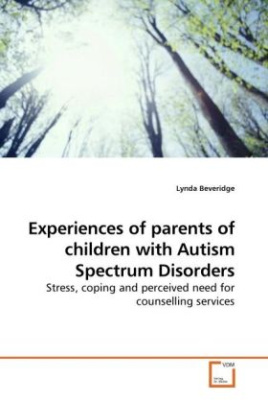 In the study reported in this book the researcher investigated the experiences of stress and coping strategies of parents of children with ASDs as well as parents experiences of professional services and their perceived need for counselling support. Currently therapeutic treatments for ASDs are often not directly funded by health ministries in Canada. Access to professional services that reflect the changing developmental needs of children is noted as a particular frustration experienced by parents. The findings should be useful to practitioners in helpgiving fields including education, social services and mental health through illuminating lifespan stressors as well as systemic barriers experienced by parents.